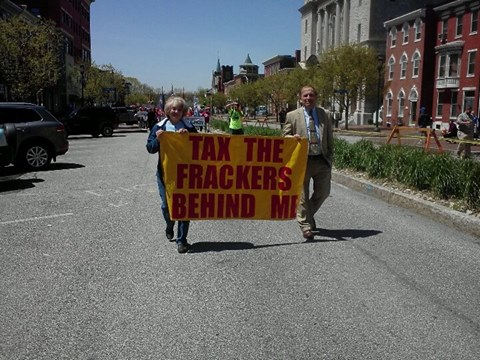 In the largest display of Astroturf organizing in recent memory, the Marcellus Shale industry today brought busloads of its employees and some lease-holding landowners to Harrisburg for a parade and a rally. The industry’s “message” was drilling means jobs. But then an activist jumped to the head of the parade and moved a better idea to the front of the parade - TAX THE FRACKERS BEHIND ME. This week Rep. DiGirolamo (R-Bucks) unveiled the Roadmap for a Stronger Pennsylvania, a sound alternative to the budget that was proposed by the governor. The Roadmap gets us on the way toward a responsible, sustainable state spending plan that makes critical investments in education, health care and communities and delays unaffordable tax cuts.